Athens Digital Arts Festival goes on a summer tour which will take the audience on a trip to #PostFuture. 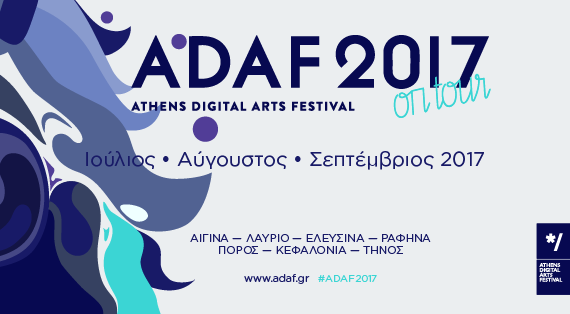 After successfully completing its 13th edition at the historic center of Athens (18-21 May / Mitropoleos 23) and awarded in Event Awards 2017 by Boussias Communications with the GOLD prize, category Best in Marketing & Communication and SILVER for the category Thematical Events, ADAF expands its activities, offering to all residents and visitors of Greek Region a unique futuristic experience. ADAF On Tour 2017 | #PostFuture offers to the public of diverse Greek regions the opportunity to get in touch with the most dynamic forms of contemporary art and culture, thus promoting the digital culture through a free, integrated program. The journey ADAF On Tour 2017 | #PostFuture begins in July, presenting its programme firstly in various locations of Attica Region and the Argosaronic Islands featuring the interactive augmented reality installation (AR+) “Prosthetic Reality Book” and a compilation of selected video art screenings under the theme of #PostFuture. During this month the program will travel to Aegina, Lavrio, Elefsina, Rafina and Poros. Furthermore, ADAF establishes another great collaboration with Saronic Ferries Consortium and presents the programme of the tour’s artistic screenings, providing the travellers with free access to digital culture. In addition, in collaboration with the International Airport of Athens “Eleftherios Venizelos”, the Festival will present to the travelers the multimedia exhibition PostFuture Journey, until the 23th of July. The tour continues in August making its first stop in Cephalonia and the renowned music festival, Saristra Festival. Here, ADAF will present #PostEarth, a series of screenings selected video art under the homonym theme, the interactive augmented reality installation “Prosthetic Reality Book” as well as the video installation “The Tide” by Vincent Masson. Finally, our last stop is the island of Tinos, on 18 and 19 August. Emanating from a very strong collaboration with “Kostas Tsoclis Museum” the Festival will have the honor to conduct kids’workshops and screenings (ADAF Kids) and present the interactive augmented reality installation “Prosthetic Reality Book”, inspired by the vision and work of the great Greek artist Kostas Tsoclis. Stay tuned because #PostFuture is still here! All the above activities are taking place admission free with the support of the Regional Operational Programme “Attiki” 2014-2020 and the European Regional Development Fund (ERDF).